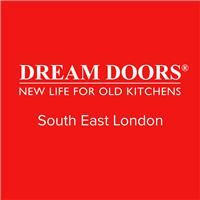 Dream Doors (SE London) - Kitchens based in London, Greater London. Run by Clive Jordan, Dream Doors S.E. London is a family business with a showroom in Eltham S.E.9. We are proud to serve all London S.E. postcodes, providing local residents with a hassle-free alternative to replacing their entire kitchen. Whether you want a completely overhaul or simply to refresh a tired and outdated kitchen, our replacement doors, accessories and appliances could save you a staggering 40% in comparison to a full refit. By adding new features, doors, drawers, worktops, lighting and clever storage solutions, we can transform your kitchen in a matter of days and with minimal disruption. We offer everything from taps and tiles to sinks and splashbacks, and our kitchen makeover service is tailored to match your needs. We only employ experienced professionals and our fitters are fully trained local craftsmen with years of combined experience. To explore our extensive range for yourself, visit our showroom and speak to the friendly staff always on hand to offer help and guidance. We pride ourselves in building the business on quality products and providing high levels of customer service.- there is absolutely no pressure to buy and we always supply free, no obligation quotes in advance.